1) I must have XXL sweat glands. 2) I am really gross. 3) Oh gawd what’s that smell?! This is me to a T, and this is why I like to think I’m a pretty tough critic when it comes to natural deodorants. I do not want to think these things every time I lift my arms! And this is why when I say that Meow Meow Tweet’s Deodorant Cream blew my mind (armpits? ), you should stop everything you’re doing and order a jar right now. Make that two, summer’s coming. Meow Meow Tweet’s Deodorant Cream is a whipped, fluffy, mousse-like cream that is easy to dig your fingers into and massage into your pits. This is crucial for those of us who count down every minute it takes to get ready and out the door in the morning. I don’t have time to scoop out a hard deodorant and melt it in my hands and apply it! A little goes a long way, but be sure to get an ample amount to 1) reduce chances for irritation (you need to ensure you’ve mixed the product well and get enough of the good natural oils and shea butter before it settles to the bottom) and 2) cover your entire stinky pit. 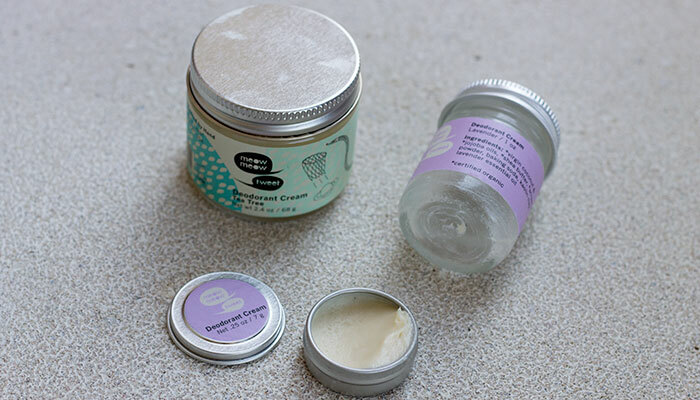 Though I mention the potential for irritation above (Meow Meow Tweet’s Deodorant Cream contains stink-fighting baking soda, which a lot of us are sensitive to), I experienced absolutely no redness, chapping or general irritation from this natural deodorant. I applied it after shaving in the morning and even twice in a day (as a pre-workout touch-up) and had no issues with irritation. And while I mention I’ve applied Meow Meow Tweet’s Deodorant Cream twice daily before my intense Ashtanga yoga sessions, that’s just a standard precaution I take with any new deodorant I’m testing. If I can get through an hour and a half sweat session without stink on a doubled-up application day, I then allow myself to just change clothes and go to class the next day without doing a touch up — that’s the major test. Meow Meow Tweet passed. And this is during 95+ degree yoga sessions, y’all. Though I do hate (strong word, I know) applying deodorant cream with my fingers to my pits, I haven’t found many natural stick deodorants that perform as well as the formulations that come in this form. This is just something green beauty lovers like you and me have become accustomed to, and we’ll need to continually educate the masses about how to use deodorant like this. So, bottom line, would I repurchase Meow Meow Tweet’s Deodorant Cream? I think I answer that in line eight or so at the beginning of this post. And if you haven’t already, check out my natural beauty buff feature with Meow Meow Tweet co-founder Tara Pelletier! What are your favorite natural deodorants? How important is texture to you when choosing a natural deodorant? Tell me in the comments section!